‘Power Players’ Reward Young Engineers: Win a USA trip! Leading younger people from across the engineering services sector have a new opportunity to be recognised and rewarded for their achievements, following the formal launch of the ECA’s ‘Power Players’ initiative. 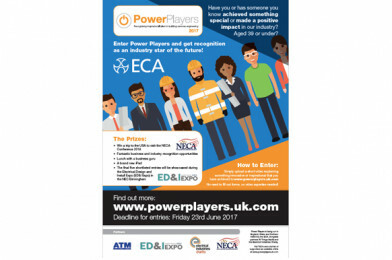 Power Players is open to entries from anyone aged 39 or below who has achieved innovative or impactful activity in their careers so far. The initiative is open until Friday the 23rd of June 2017. To enter, individuals simply need to submit a short video at www.powerplayers.uk.com. There are a range of top-quality prizes for the two most impressive Power Players, including the opportunity of a lifetime of a business and networking trip to the USA. Other prizes include lunch with business guru Sir John Parker, who is the chair of global mining firm Anglo American. For more information on how to enter and the full terms and conditions of the initiative, please visit the website.